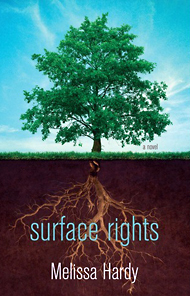 Surface Rights, published by Dundurn Press, is a contemporary novel about a middle-aged woman who travels to the family cottage to scatter the ashes of her husband, father and twin sister, only to discover that a mysterious and menacing stranger has claim-staked a portion of her property. In the course of dealing with this intrusion, she must also contend with her troubled past, her adversarial relationship with her sister and her own self-destructive tendencies. Surface Rights is a darkly funny novel about belonging, family, dogs, fear of fat, ghosts and place. I would like to acknowledge the support of the Ontario Arts Council during the writing of Surface Rights.